As Tom Curtis observed, Lewandowsky has no moral alternative but to withdraw his paper. At most Lewandowsky has been too casual in screening for gamed responses; and slightly over interpreted the results. That represents a major flaw in the paper (if I am correct); but has no implications whatever about Lewandowsky’s integrity as a scientist. IMO, Lewandowsky’s choice of a title is, and should be, far more damaging to his reputation as a scientist than the other flaws (IMO) in his paper. We’ll soon see whether Lewandowsky’s allegiance to the Cause and to his own self-importance is greater than his commitment to science. 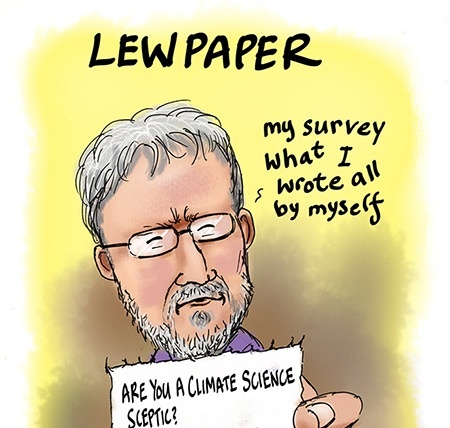 If Lewandowsky ignores Curtis’ call to withdraw the paper and, despite knowing of important flaws, proceeds to, in Curtis’ words, “knowingly allow falsehood to be published under [his] name”, it will also provide an interesting test of the relative strength of Curtis’ allegiance to the Cause relative to his commitment to science. I quite agree with Balrick. Also the techniques that Lewandowsky employs would be useful in undergraduate courses on polling and data analysis. Big Tick (√) to Steve, Josh and Simon! I often thought he was a climate realist in disguise..and was pretending to be a $CAGW$ supporter. And making them look insane. His writing is beyond parody..
Fortunately….thanks to Professor Loo’s warning….i was able to stop reading “skeptic posts” and “skeptic comments” just prior to my IQ plunging to zero. The warning for humanity is that an irrational hypothesis CAN be supported with bogus methods and fictional evidence. Unfortunately….the inmates are in charge of the asylum. Your claim that, “As Tom Curtis observed, Lewandowsky has no moral alternative but to withdraw his paper” is an over interpretation of my words. It is very obvious that Lewandowsky has the very moral option of simply disagreeing with my analysis. If he disagreed, then he would be acting immorally if he did rewrite, withdraw or retract. This is a distinction you should easily be able to make. If you cannot, you are committed to the belief that every climate change “skeptic” with whom I disagree and who does not rewrite, withdraw or retract is acting immorally – a view to which I certainly do not hold.